OMG - I'm going to Wyoming in July! I can't believe it! I'm actually booked on a 10 day trip that starts in Salt Lake City and goes through the Grand Tetons, Yellowstone, Cody, into Montana, over to Mount Rushmore, though Cheyenne, and ends up in Denver. I'm so excited, I had to share the news! I managed to find a logical breaking point to divide the enormous 165,000 word 'Red Stallion' into two books, and renamed the final volume 'The Law of Greenlea County' which begins with the apprehension of Lorenzo 'Larry' Esteban. you want me to slow down now? Hahahaha, I think you'll get overruled! great Googly Moogly! I finished! The original Laramie Saga stories have now been reedited into the 8 volume 'Tales of Greenlea County' and the final volume with epilogue is now up on my site. Next I will be tackling the post-Saga stories in chronological order, starting with the passion-filled voyage of self discovery in 'Dupree's Choice.' And I will be posting those on a regular schedule. Yippee! I should buy myself an ice cream cone or something! WOW...imagine Chris Farley in TommyBoy saying, "that's....AWESOME!" Seriously, how exciting! A big THANK YOU from the fandom! We'd buy you Baskin Robbins! Now go take a much needed break! Please!! with the big psychological relief of having the first eight books edited, I am finding it difficult to focus on the 'Grey Girls' tonight so I guess I'm just going to think about politics for tonight!!! 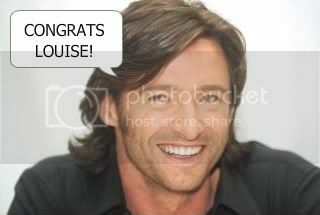 Here you go Louise! You more than deserve it. Mmmmm that looks good Fabienne! I hope she gets here in time to eat it - we may have to dig in!! That does look good! And we know Ellery and Colson love ice cream, too! A happy newlywed wanted to stop by and see you, Louise!